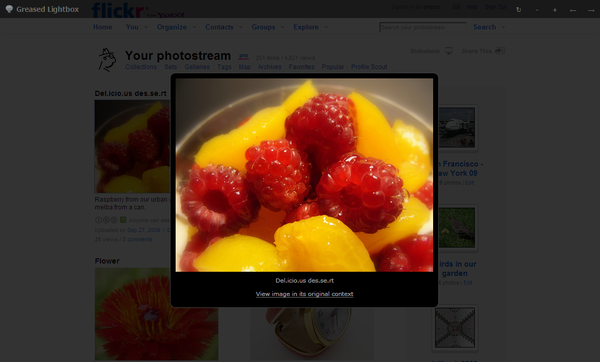 Although Flickr sports a functional, lightweight interface, it still has some room for improvement. And if you are using Firefox as your primary browser, you can turbocharge the photo sharing service by installing the Better Flickr and Greased Lightbox extensions. Greased Lightbox is a one-trick pony, but the trick it does is a pretty clever one. Normally, clicking on a thumbnail in a Flickr gallery or your photostream opens the related photo page. The Greased Lightbox extension changes the default behavior, so when you click on a thumbnail, the related photo appears as a slide on top of the main window. You can then use the Left and Right arrow keys to browse through the photos in the current gallery or photostream. You can jump to the related photo page by clicking on the View image in its original context link at the bottom of the slide, and quit the slide show view by pressing the Esc key. This seemingly minor tweak hugely improves the way you can view and browse photos on Flickr. 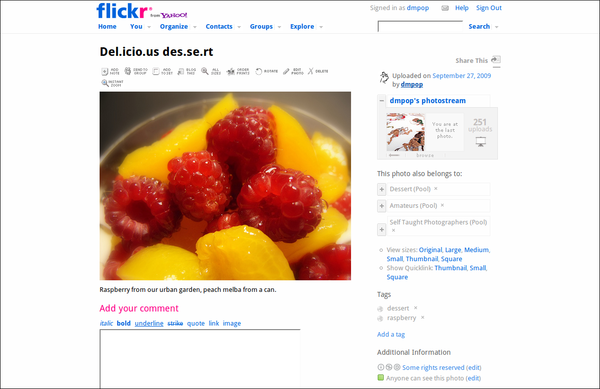 Similar to Greased Lightbox, the Better Flickr extension is a collection of compiled Greasemonkey scripts that add a few nifty features to Flickr's interface. To enable the available scripts, choose Tools -> Add-ons, select the Better Flickr extension, and press the Preferences button. The General section sports a few scripts, including the Enhance Photo Page, Show Flic.kr Short URL. The Enhance Photo Page script adds, among other things, quick links to different versions of the photo (e.g., Original, Large, Medium, Small, etc. ), and quick links to HTML code you can use to embed the photo into a Web page. As the name suggests, the Show Flic.kr Short URL script displays a short URL of the current photo page suitable for use with micro-blogging services like Identi.ca and Twitter. The Show Total script displays the number of views, notes, and favorites under each thumbnail in the current set. In the Comments section, you can also enable the Add Rich Edit Controls script that adds formatting buttons right above the comment area, making it significantly easier to format text in the comment box.